Eight NBA players are guaranteed more than $150 million in salary. Seven - Russell Westbrook, James Harden, John Wall, Stephen Curry, Karl-Anthony Towns and LeBron James - were All-Stars last year, and another - Chris Paul - absolutely should have been. The outlier: Devin Booker, whom the Suns gave a max contract extension projected to be worth $158 million over five years. Booker has never been an All-Star nor deserved to be one. Phoenix has peaked at 24 wins with him. He ranked 502nd last season with a real plus-minus of -2.44, a personal best. On the other hand, the Suns are paying for what Booker will do, not what he has done. He's an extremely talented scorer with playmaking skills and the frame to impact games far more than he has. Importantly, he's just 21. Is Booker worthy of being a franchise player? But Phoenix rushed to pay him like one this summer despite the uncertainty. 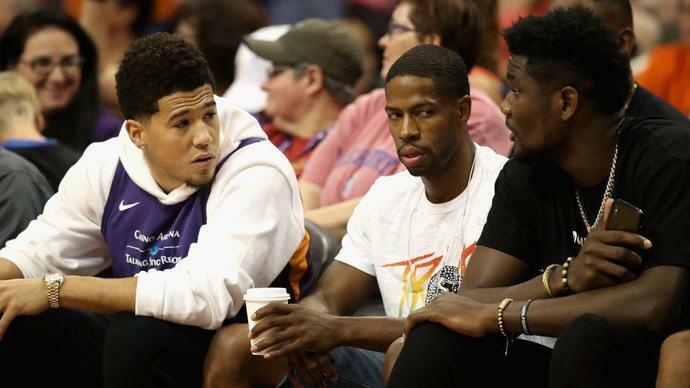 The Suns could have waited, assessed Booker over the season and re-signed him as a restricted free agent summer. That might have hurt Booker's feelings, or it might have driven him to compete harder next year. I think it would have been worth the downside of delaying. Booker's value just isn't clear enough to justify lavishing him with a full max contract now. To extend him this summer, Phoenix should have demanded some salary concessions. The Suns had to take their other high-stakes gamble of the offseason, drafting Deandre Ayton No. 1. Ayton looked like a good choice, but top picks are so pivotal. It was extremely important to get this right. Especially because Phoenix seems intent on escaping the bottom of the standings. The Suns signed veteran Trevor Ariza to a one-year, $15 million contract and traded the No. 16 pick and the Heat's unprotected 2021 pick for No. 10 pick Mikal Bridges, one of the draft's most NBA-ready players. Ariza and Bridges join Josh Jackson and T.J. Warren as versatile forwards on the roster. Phoenix also traded for its new starting power forward, Ryan Anderson. I liked that deal, considering Anderson reduced his 2019-20 salary guarantee to match outgoing Brandon Knight's. The Suns also upgraded prospects in the swap, going from Marquese Chriss to No. 46 pick De'Anthony Melton. Anderson has taken a lot of grief for his playoff shortcomings, but he was still a productive regular-season player last year. The upcoming regular season is apparently a priority in Phoenix, where an eight-year playoff drought - longest in franchise history - runs. Owner Robert Sarver isn't known for his patience. But if the Suns are trying to make the playoffs, they were absolutely negligent at point guard. Their options: No. 31 pick Elie Okobo, Melton, Isaiah Canaan (signed to an unguaranteed minimum contract), Shaquille Harrison (who received a $50,000 guarantee this summer) and Booker playing out of position once he gets healthy. That's not going to cut it in a loaded Western Conference. Phoenix even seemed more concerned with getting another backup center than a starting point guard, executing two trades - dealing a second-rounder to the Nets to downgrade from Jared Dudley's salary to Darrell Arthur's then sending $1 million to the 76ers - to land Richaun Holmes. With the $15 million and two first-round picks they used to get Ariza and Bridges, the Suns could have signed or traded for a solid point guard. Instead, that money and those picks went toward adding even more combo forwards. How innovative will first-time head coach Igor Kokoskov be? I'm not sure Brad Stevens or Gregg Popovich could scheme their way through this point-guard void. For so long, I wanted to give the Suns' offseason an incomplete. But they're starting training camp with this roster with apparently no trade imminent. It's time to assess. I don't see how this roster works in the short term, and it's a little less flexible and asset-rich in the long-term.